Image is from Petersburg, 1865 after the city was finally in Federal hands by April 3rd, after ten months of siege. One can see the devastation the siege wrought on the city by the rubble and buildings in the background. The image was taken in a residential area with a gas lamp to the far left of the frame. It is still cold and the leaves have yet to return on the trees. Another indication of time of year is the great coat slung over the musket stack in the foreground. A big indicator of this is the arm with its french cuff visible as pictured here. Greatcoats sported a long rear cape and a high collar made of thick kersey blue wool. The wearer obviously did not need it at this moment and chose to disrobe. I have found that the cape works well for a face covering when sleeping out if one needs an additional layer. Enlisted men were allowed limited baggage and would often mail home such articles of clothing once campaign season returned as they would have to carry everything with them otherwise, greatcoats being heavy and cumbersome to pack in the two compartment knapsack. Or, they would simply discard the extra impediments once winter weather was over hoping to draw new by next winter. The rifle stacks themselves are another facet of soldier life. Formed of three central muskets whose bayonets have been intertwined to form a teepee, the formation was devised as a way of keeping soldiers from losing their weapons while halted and on rest, for allowing a formation of four men, two in front and two in back, to intertwine and remove their pieces while in company front (two files), and for quick breaking down of the stack when ready to move on. These stacks are made whenever a unit is at rest after a halt and when in camp but on other duties and a musket is not required. You can see the ghost of a soldier on the upper left side of the frame and several others barely visible on the hillside. Another common feature of the musket stack is the hanging of a soldier’s basic kit or “traps” as they were called by the soldiers. A soldier’s traps would consist of his leathers: cartridge box with sling, belt and brass buckle, haversack, water bottle, and bayonet and frog. You can see that several leathers have been wrapped over the stacks. These would belong to the individuals who would line up behind that stack in the company formation. On the ground are several bundles of blankets and other personal gear. If this were a permanent movement, the privates would also have grounded their knapsacks in front of the rifle stacks or some distance beyond also in formation or if they expected to be in close contact with the enemy. What is more probable, is that this is not a permanent movement of troops but a patrol into the city 9though the blanket rolls do indicate a possible anticipation of a longer sojourn). The length of the stacks width wise indicates a company sized unit. A regiment or battalion sized stack would have extended much further down the street and would have been broken down into companies with the center or left most having the regimental flag rolled up and laid across the stacks lengthwise. None is clearly visible. 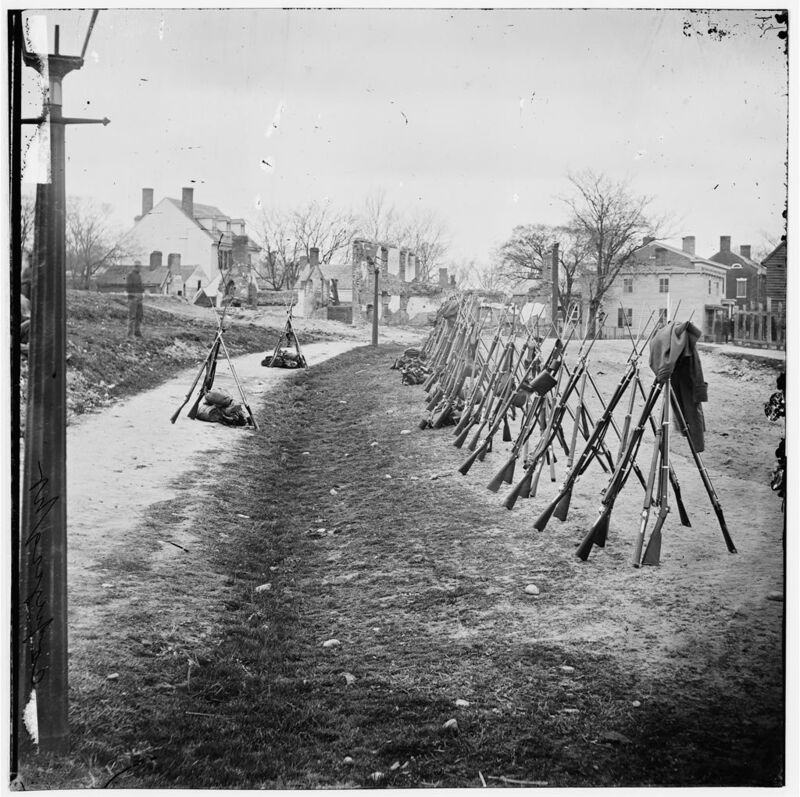 The stacks of rifles out in front of the formation would be those of the non commissioned officers who would act as file closers when in company front (two files standing shoulder to shoulder) and whose position in line of march is to the right flank of the marching column or in company front are in the rear of the formation. It is probable that we are looking at the rear elements of the stack and the soldiers would have faced to the right when in company front to stack their muskets and then been released from formation by which most have found a place to sit or lie on the hillside behind them. One can barely make out men in the upper right quadrant of the image by a house with a fence, possibly officers. If you attend any civil war reenactments, these stacks are as ubiquitous as tents, but know that they served a specific purpose in the life of the soldier and not just for spectator show. What is really interesting about this photo is the information that can be gleaned from high resolution examination of the weapons and accouterments shown. While most of the muskets are Model 1863 varients, at least one of them is of the Model 1861 issue. The cartridge boxes are of late war issue with the “US” embossed in the leather cover rather than having the brass plate attached. Also most seem to be carried on the waist belt instead of having the regulation shoulder strap. How often we see these photos without realizing what stories they can tell us. Those details I did not see, great catch. The more I study these images the more I’m convinced there are no absolutes when it comes to civil war uniform and equipment issue.